Synchronization: This type of solution ensures that the data streams will be synchronized based on shared events sent during the recording. Biometric integration: This type of solution will also ensure that the data streams will be synchronized for later analysis. In addition, the solution includes a software that will merge the eye tracking and biometric data streams and will offer analysis tools for your biometric data. 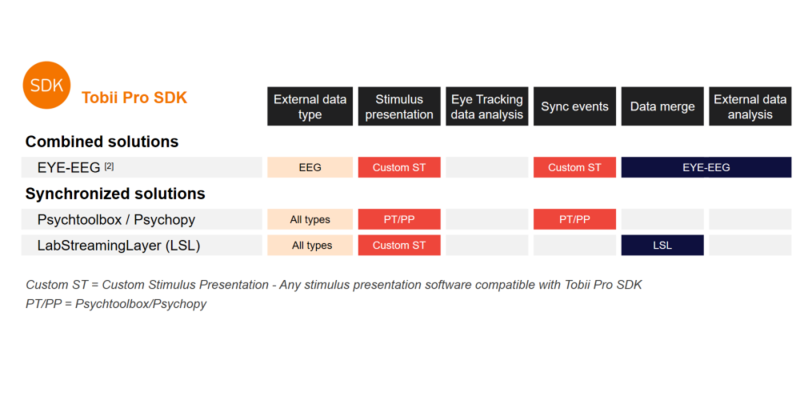 The available solutions for co-registration of Tobii Pro screen-based eye tracking data with other biometric data will be mainly determined by the eye tracking recording software that is used. 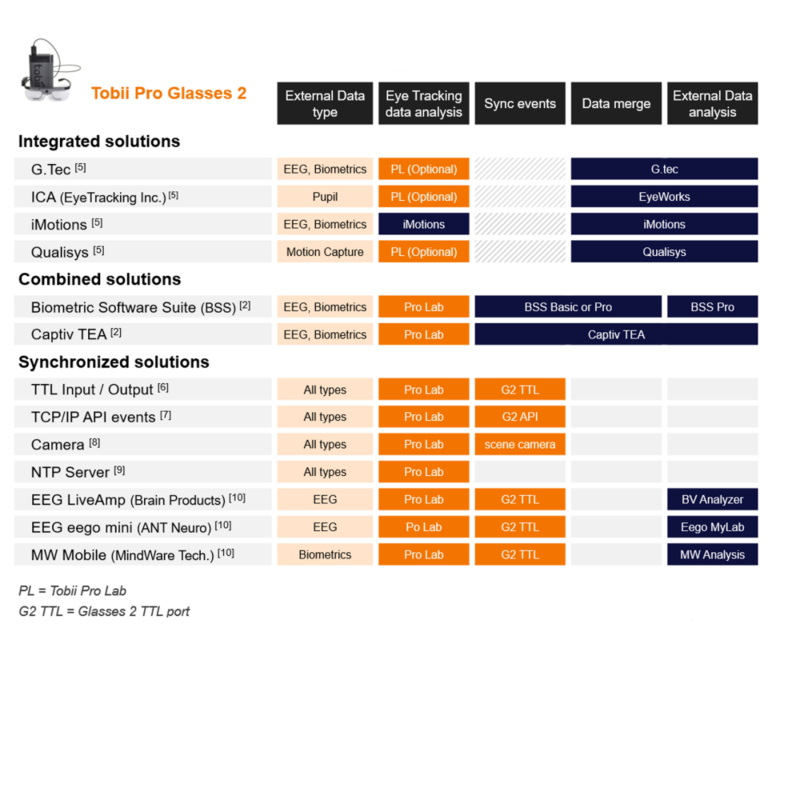 In the following tables, you can find an overview of the available Tobii Pro solutions for co-registration of screen-based eye trackers with other biometric devices split by recording software. You will also find a table dedicated to co-registration solutions when using our wearable eye tracker, Tobii Pro Glasses 2. 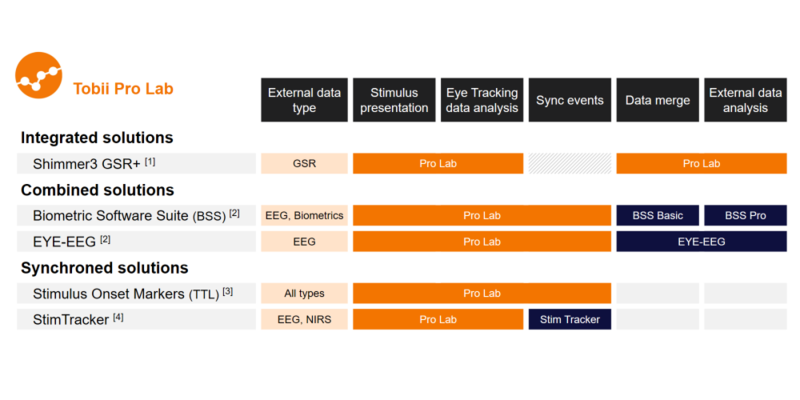 Tobii Pro Lab sends accurate TTL events at the onset of every stimulus to any biometric device with a TTL input port. StimTracker (Cedrus®) is a hardware device that sends accurate TTL shared events to your eye tracking and biometric data based on a light sensor attached to your stimulus monitor. Tobii Pro API is freely available. It can be used to send shared events to Tobii Pro Studio via TCP/IP from any custom application created by the user (e.g. Matlab, Python). The Glasses 2 recording unit is able to send and receive 1-bit TTL events during the recording. The events can be used to timestamp important events during the recording or to synchronize the Glasses 2 with other biometric data stream. API. It can be used to send shared events to Tobii Pro Studio from any custom application created by the user (e.g. Matlab, Python). Camera events are the easiest way to create events in the Glasses 2 data stream. Any event can be recorded by the Glasses 2 scene camera. After the recording, the events are marked and added to the eye tracking data stream. The Glasses 2 clock can be synchronized with an NTP server. All the biometric devices that share the same clock can be automatically synchronized based on the timestamp values.